According to HindSite’s sixth annual Green Industry Benchmark Report, green industry businesses are busy, but struggling to find employees. With nearly 70 pages of results and analysis and more than 50 graphs, the Green Industry Benchmark Report helps green industry businesses better understand how their peers operate - and take steps to improve their businesses. HindSite Software, a leading provider of field service software to the green industry, today released their annual Green Industry Benchmark Report, which found businesses struggling to find employees. A remarkable 88% said they found it somewhat or extremely difficult to find good applicants for their business, up slightly from a year ago. As a result, 80% of respondents expect to raise prices next year, with 43% of employees citing rising employee costs as the primary driver of their increased process. In order to attract and retain their employees, wages are going up, with 43% expecting to increase wages by at least 3% next year. 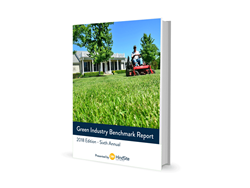 The Green Industry Benchmark Report details the results of a two-month-long surveying effort that reflects the opinions of nearly 300 green industry business owners and managers who provide services including landscaping, irrigation service, mowing, fertilizing and snow removal. This is the sixth year HindSite Software has released a Green Industry Benchmark Report. Economic optimism abounds in the green industry, with 70% of respondents expecting the economy to improve in 2018, up from 48% just two years ago. A tight labor market is the biggest concern for a typical green industry business. 88% of respondents find it somewhat or very difficult to find employees, while just 1% said it was very easy. Additionally, attracting and retaining employees was the number one issue for the typical green industry business, with 36% saying it was their biggest issue. As a result of the tight labor market, prices and wages will likely increase in 2018. 43% of respondents expect to raise wages by more than 3%, while 80% expect to increase prices. 43% cited rising labor costs as their primary reason for raising prices. To combat a tight labor market, businesses are turning to field service software to be more efficient. Half of respondents now use software, up 7% from a year ago. 43% of field service software users said that the primary benefit is efficiency. Another way businesses are combatting a tight labor market is by improving employee benefits. Last year, 40% of respondents said they offer health benefits. This year, 45% do. Businesses expect healthy revenue growth in 2018, with 87% expecting their revenue to increase this year. 74% of businesses experienced year-over-year revenue growth in 2017. Weekly training is an indicator of success, with those that train their employees weekly more likely to experience revenue growth in excess of 10%. This year’s Benchmark Report added information about wages for typical green industry business laborers, including irrigation technicians, crew leaders and crew members. The Green Industry Benchmark Report is available to download free at http://info.hindsitesoftware.com/2018-green-industry-benchmark-report. HindSite Software has helped green industry contractors better manage and grow their businesses with field service management software since 2001. HindSite today sells two software solutions. The HindSite Solution is designed for field service businesses while FieldCentral is lawn maintenance software. Both solutions help businesses market, sell, schedule, route, manage their field employees and invoice. To learn more, visit http://www.hindsitesoftware.com.